Kerstboodschap 2018 van Amalia uit Kabwa - Stichting "Lang leve het Zambiaanse kind"
Christmas is the time to be closer to each other, time to say thank you for the many good things we have received, time to look at people in the eye and see the joy and the sufferings that they experience. 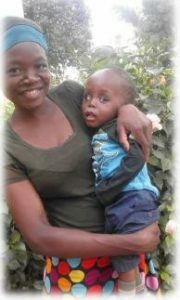 I see this mother, in spite of having a microcephalus child she holds it with love and care, her smile is full of peace and serenity, she lives in hope that God will give the strength to care for this child through life. The meaning of Christmas is “HOPE”. This is what we wish to all our dear benefactors. You have helped us in many ways, by your friendship, by your support spiritual and financial, by your care. On behalf of the orphans and children with disability who benefited from your donation, we say thank you very much and wish you.